Interactive public art map created by Kelley Crawford, Emma Fick, and Steven Melendez. Six months ago four women from EPNO (Emerging Philanthropists of New Orleans) and two women from NolaVie sat around a table in an office that overlooked the river. “We want to create an interactive public art map,” I (managing editor at NolaVie) and Renee Peck (editor and co-founder of NolaVie), said. From there, a new partnership with artist and author Emma Fick formed and so did design meetings with writer and digital map maker Steven Melendez. 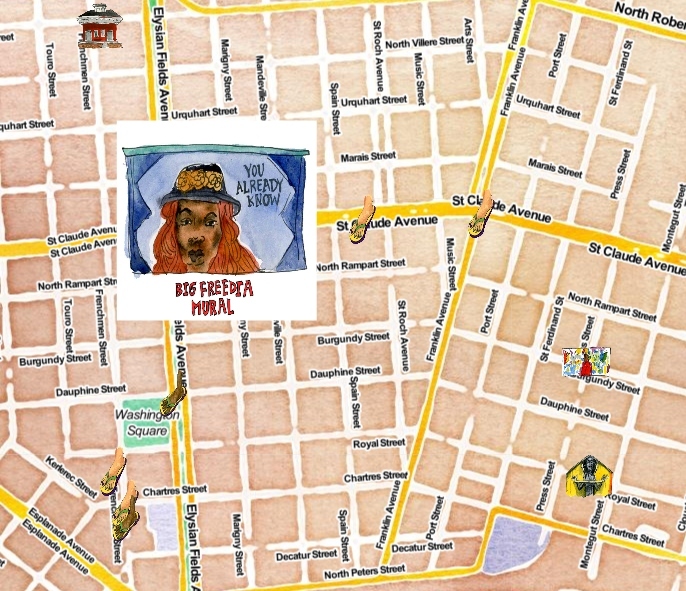 By using both the archives of ViaNolaVie, which has over 6,000 stories on arts and culture in New Orleans, and working with local writers, students, and photographers, “Footprints: An Interactive Public Art Map” was created. There is a mix of illustrations (all by artist Emma Fick), audio, and video to accompany the text that maps out over 60 public art pieces in New Orleans. Take a look, take a walk, and enjoy the museum of our city streets! 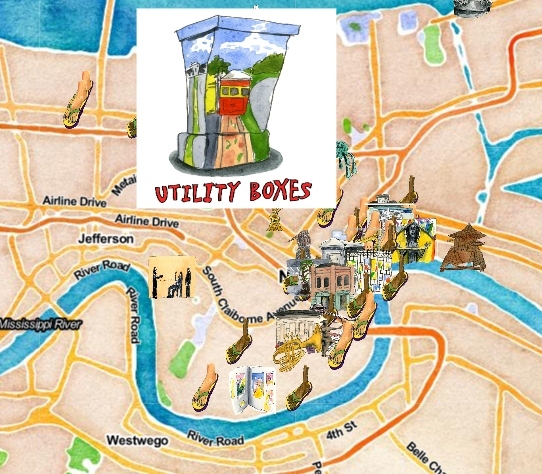 This art map was created by Kelley Crawford, Steven Melendez, and Emma Fick. It was made possible through a grant provided by EPNO (Emerging Philanthropist of New Orleans). We would like to dedicate this map, which will continue to grow, to Sharee Wells, the executive director of EPNO who made this project — and many others like it — possible. She will always be in our hearts, our minds, and within the beauty of New Orleans forever. If you have suggestions, with locations and/or information about a piece of public art, please email Kelley Crawford at Kelley@nolavie.com. ViaNolaVie: How it all started Like all successful partnerships, ViaNolaVie started with a shared idea, a mutual need,... Walk a mile: James Chamberlynn McGriggs combine her love of illustrating with her love of people in this series "Walk a Mile." She interviews people who are marginalized about their everyday, and then translates their interview into an illustrated series. First up is is James who wants to be "jolly as hell."